Posted 01-15-2019 by Sherrel Stewart. The base of the Confederate monument in Linn Park remains covered. A Jefferson County circuit judge struck down a state law to preserve historical markers, saying the state violated the U.S. Constitution. 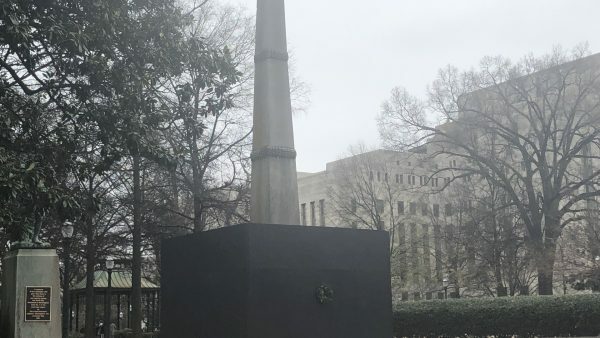 The ruling comes after the state sued Birmingham for covering a Confederate monument and fined the city for violating the Alabama Memorial Preservation Act. Judge Mike Graffeo says the state cannot force Birmingham to maintain a Confederate monument with a law passed by the state Legislature in 2017. Lawyers for Birmingham argued the monument offended most residents. David Dinielli of the Southern Poverty Law Center says cities express their values through their monuments, and says demographics were a factor in the ruling. “The majority of the legislature, which is white, was issuing a rule that governed and limited the ability of Birmingham, which is a majority black city, to govern itself and make its own decisions,” Dinielli says. The ruling may impact similar cases in other parts of the country, he says. “To our knowledge, this is the first time that a court has held that one of these monument preservation laws violates the U.S. Constitution,” Dinielli says. Alabama State Attorney General Steve Marshall sued Birmingham the day after it covered the monument in Linn Park. He says he will appeal the ruling.